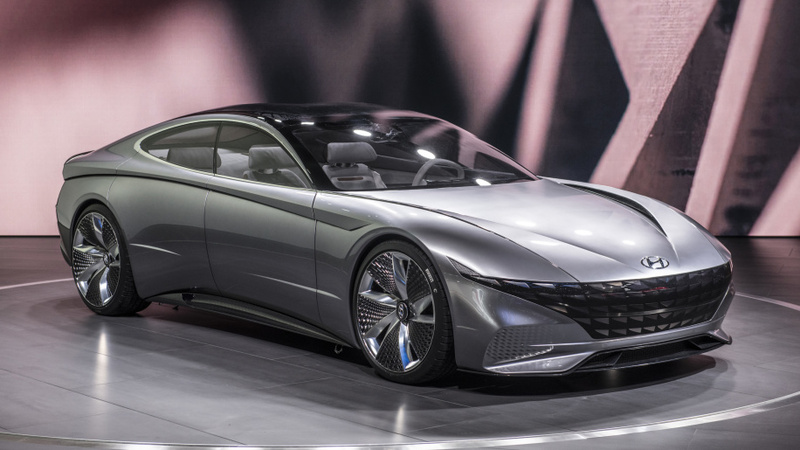 The next generation Sonata will debut at the 2019 New York Auto Show this April. Some seem to think that the Le Fil Rouge concept may have previewed some of the new styling updates, but this would be a huge revision. For those who haven't seen it, its a very futuristic looking sedan. I like what i'm seeing so far which is a sedan that takes after the increase in sportiness we're seeing from brands like VW and even Honda with the new Accord. It also addresses concerns I had around the Sonata, being a great commuter car that does a lot of good things but nothing great. Meanwhile those new models I mentioned DO in fact stand out as greats. They may take some of the design cues from this concept, but we've already seen in some spy shots that the body lines are a bit different from the test mules. It looks like for 2020 that they are going with a coupe like body style, which should help to give it a much needed fresh design. With the declining interest in this segment, I think Hyundai realizes that they need to make some large revisions if they want to keep buyers interested in their new products. The whole reason why Fords sedans fell out of favor is because they did very little to update them from one MY to the next. Why pay full price for something that you could get used with more equipment? Lucky for Hyundai the haven't gotten nearly as bad as Honda, a brand that used to be leader but slipped through the cracks and is now slowly emerging. Both Honda and Toyota have seen a drop in sales, even with the redesigns they've given to the new Accord and Camry. The best way forward with sedans is to begin offering electrified variants that come with brand new technology/features. Its a tough time to be an automaker when you have lost your original customer base to many other brands that keep putting up a fight and offer endless options. Honda might be able to win by partnering up with other brands that have yet to enter north america. Suzuki being one of them that could emerge again. Electrification will mark a huge shift in the industry that will probably radically change the types of vehicles that people are buying. With what we've seen from new electric start ups like Rivian, it doesn't seem like a larger platform really makes all that much of a difference in regards to electric range and performance. One key fact people leave out when mentioning upcoming electric vehicles is the fact that autonomous tech is also growing rapidly. Often batched with EV's and will be going forward. Until we get real world numbers from these 'concept' EV's, I would take all these on paper figures with a grain of salt. Don't get me wrong, its great that we are seeing more new vehicles from private companies as competition will only lead to better products across the board.